Are you looking for the best 360º editing software to use on your, mobile, PC or Mac? These are the best that are available for editing your 360° photos and videos while at home or on the fly. Remember because you’re using a specific make of camera, that doesn’t mean that you’re stuck using their software. All are FREE unless stated. I started this list back on the 5th April 2017 and I’ll keep on adding and updating the page as I come across new stuff, so keep your eye on it. This for me is now the best 360 editing software. They are finally allowing you to gid rid of the Veer watermark, you can choose to have their logo, your own logo or nothing at all. This move has made this the top editor for me now as it has some great features. You can add floating text, stickers, smiley faces anywhere on screen. You can include your photos in a video. It has loads of music to choose from to and it’s all completely free. This isn’t made for any specific camera, its out there for all 360° cameras and Its so damn simple to use. Just select the videos you want and it gives you a timeline of videos that you can then drag and drop to change sequence and edit them all at the same time. You can even choose to make slow/fast motion videos, trim several moments from the same video, set a new centre, add music, filters and all for free. Update: They have improved the app now level your horizon, re-centre and add spacial audio. With the latest update on android you can now set the focus point, add a text intro (not overlay), set transitions, combine clips, trim, sort, add music, and save your 360 video in beautiful 4K resolution straight from your mobile phone. One thing missing is the ability to use fast/slow motion. Theta have finally merged their two apps into one. Theta+ allows you to easily edit any 360º images not just ones shot with RICOH THETA. You can animate your photos with a bunch of different angles to choose from and you can even customise it to your preference, change the start and stop positions, direction, speeds. You can crop, switch the viewing mode, change the color tone, and other editing operations, and the edited images can be shared easily by posting to social networks such as Instagram or Facebook. Video editing is fairly basic but It lets you switch the view, crop, change the colour tones, add music and use filters. The app works upside down which is a little weird at first, but isn’t a problem. This app is meant for controlling the Xiaomi mi Sphere, but you can use it for any 360 footage taken with any 360 camera. It does creating full resolution screenshots from within your photo or create tiny planets, addd filters and also it does have free capture. You can upload your 360 video, then while you watch back your footage you can record what your looking at as your panning around creating a standard 16:9 video of all the best bits of your 360 footage. Though it doesn’t use the phones gyro, you have to pan using your finger, so for me this spoils the feature as its stop start and not fluid movement. Bit of a strange decision to bring out another app to control the Madventure when the current Xiaomi mi Sphere app controls what is essentially the same camera. Not sure why they decided this, I guess it’s all down to marketing. You can use this for removing unwanted items in your photos. I’ve use this for cleaning up the nadir and removing the tripod or myself from the picture when I haven’t had a desktop at hand. Doing so can be made easier if you use the Orthogonal decomp tool with Edit360 app. You can follow my tutorial for that here. Update: It’s now easy to to edit your 360 photos on mobile with the latest version of Touch Retouch 4.2. Now 360 aware, allowing you to simply drag the photo around and remove unwanted objects. This is the only app i’ve found that offers the ability to edit the orientation of a 360 still and you can use a shot taken from any camera. I’ve been there. You’ve been out shooting and think you’ve taken that amazing shot, but later realise the horizon is all skew whiff or the key focal point is off. Don’t worry because it can be fixed with this app. It’s easy to use, with very simple controls allowing you to straighten horizons and re-centre images manually. It also re-injects metadata if its missing. There are two versions of this app, the free version is great, but you are limited on the quality of output. If you plan on showing off your shots in VR or a big screen then its best to upgrade to Pro. See my tutorial of how to use it here. This is a must if your a Xiaomi Mi Sphere owner (Review here) as you can achieve optical flow stitching thanks to Yoichi Hirota’s amazing app, MiSphere Converter. It can open and stitch both Jpeg and Raw DNG files. Auto level horizons, plus manual fine tuning and improve any colour difference between the lenses. It’s currently only available for Android on Google Play. Check out my tutorial of how to use it here. This app is for the Xiaomi Mi Sphere (Review here) and it downloads both unstitched Jpg or DNG files over wifi. Its an app from the man himself Yoichi Horota. This lets you sync to the camera, select your photos, download and even an option to stitch. Its currently an unreleased beta version, but it works. All you do is connect the camera to your phones WiFi, open the MiSphere Transfer app, choose which dated folder to download and press sync. It saves all the unstitched files from that dated folder into a folder on your phone called MiSphere Transfer. It’s as easy as that. Though I have had a few times where it can’t find the camera, I simply force close and re open and it then works again. This ones for Samsung users only and available on the Galaxy App store. You can edit your 360° photos. Switch the view, crop, apply colour tones, add effects, music, patch the nadir, add another image, stickers or labels. It can even detect people’s faces, help you edit them and automatically blur them. You can hide faces, brighten faces, skin tone correction and eye enlarging features. The downside I’ve found it only recognises Samsung 360 files that are straight from the Gear360 camera, if you’ve used a 3rd party app to colour grade or straighten the horizon then the file will no longer be recognised as 360 and won’t open. You may be directed to another page if Galaxy Apps is not installed on your device. Get rid of the unsightly seam after editing on your mobile with the likes of Snapseed for Free. Best of all it doesn’t matter which camera your using, this should work on images from any 360 camera. This one isn’t free, but is a dedicated 360 pano editor available on all formats. Finally there’s an Android app that lets you ‘animate’ cinemagraph style GIFs and videos from still JPEGs. Ever since plotograph was released on IoS the android users have been left out in the cold with the website displaying android version ‘coming soon’. It’s been months now and it seems plotograph are no closer to a release. Well now there’s a new app appeared and it’s called Zoetropic. It may not be as smooth as plotograph, but its a start. There are two versions available of this app, the first being the free version, your limited on the speed & resolution of the output. The second is the paid version with no restrictions for only £1.89 which currently supports 1280 x 1280 resolution. less than half the price of plotograph. This program lets you ‘animate’ cinemagraph style GIFs and videos from still JPEGs. Check out my first effort below next to the original. The only down side it’s IoS only & not free, £4.99. Unfortunately this isn’t available for android 😭 It’s iPhone users only, but it is an amazing app for animating your 360 pictures. I don’t own an Iphone, but it’s almost tempting to get hold of one just for this app. Come on Rollworld make an android version already!! This one is available on Android and is great for creating those tiny planets and worm holes. It allows you to adjust all angles from, latitude, longitude, the bulge, zoom, rotate and change its position on the screen. It’s not as good as roll world, but for Android its the best i’ve found so far. This is almost like having photoshop in your pocket. It has some fantastic features for a mobile app, with lots of tools like the healing brush, selective adjustments and a bunch of filters. It’s a must have for post processing your snaps on the move. Photo Editor has been designed to easily adjust color, add effects, rotate, crop, resize frame, clone and draw on your photos. It also bundles a large variety of effects to help you create your masterpiece. I use this to create the lensball effect as it allows you to edit layers. See my lensball tutorial here. Photo Exif Editor on Android allows you to view, modify and remove the Exif data of your pictures. You can change the date, time and location of a picture to anywhere. You can remove/strip all Exif tags inside the photos if you wished to, you can even highlight a bunch of pictures and batch update the data all at once. This is really handy if you’ve had to edit an image to colour grade or remove blemishes and the editing app you used has removed location data etc. this allows you to batch process multiple files at once and also allows you to add GPS location to each of your shots with a simple dropping of a pin on google maps. This is especially great if you want to upload to street view. IOS users can try this. I’m not to sure what it’s like as i’m not an apple user, but i’m told it does the job. Please let me know what you think. This app enables you to upload your 360 panorama images to Facebook / GooglePhotos etc, by adding exif tag (based on Photosphere XMP). If you already own Yoichi’ Edit360 then you wont need this as that will also inject missing metadata. Thanks to Jim Jenson for adding this to the list. Insta360 Studio is by far the best software for manipulating 360 photos and videos and now we have the updated version for the One X and yes it’s still FREE and available for both Windows and Mac. It even works with images & videos taken with ANY 360 camera as long as they’re stitched in standard equirectangular .mp4 format. Which means you will firstly need to stitch the files using your cameras app first. Then when the file is stitched, you can open it in insta studio. This has been by far the best software I found for manipulating 360 for FREE and available for both Windows and Mac. It can be used for videos taken by other 360 cameras as long as they’re stitched in standard equirectangular .mp4 format. Which means you will firstly need to stitch the files using your cameras app first. Then when the file is stitched, you can open it in insta studio. You can use the studio to edit videos only. You can only view photos. A new software for manipulating 360 video for FREE and available for both Windows and Mac. It can be used for videos taken by other 360 cameras as long as they’re stitched in standard equirectangular .mp4 format. Which means you will firstly need to stitch the files using your cameras app first. Then when the file is stitched, you can open it in 360 Ninja. Check out 360 Ninja here. 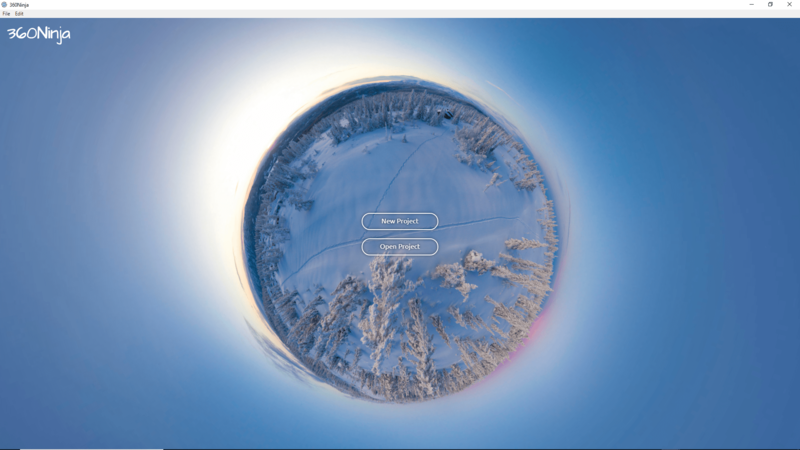 Also FREE, this one lets you change the orientation of your 360 video, add transitions, titles and text. I’ve been using it if i’ve decided I need to change the starting focal point of my videos and add floating text, which you can have appear anywhere, stay and disappear to whatever time you choose. Considering this is free It’s some pretty advanced editing software. With the release of the new 2017 Samsung Gear 360 come different versions of Samsung’s 360 software with the ActionDirector Version 2 desktop and the Gear 360 (New) manager app. This allows you to colour grade, cut, trim, add music, a text intro (not floating). It’s pretty poor in all honesty. Gear 360 users should use it for stitching their videos, maybe the colour grade and then go onto one of the other better softwares out there. For some reason samsung have chosen not to update the original, so you’ll have to search and download the new version manually. Gopro have also released their New Fusion Studio software. However it only works with fusion footage. You can now stitch Xiaomi Mi Sphere and Madventure360 on desktop with the newly released software. Currently only available for PC, but they are working on a MAC version. In the meantime they have released a MAC stitching tool you can download below or failing that there is an unofficial Mac stitching tool here. It doesn’t come cheap though with a monthly fee of £19.97 a month. If you really like adobe then maybe consider the all app bundle which includes these two, photoshop and a lot more, but that comes in at £49.94 /mo. Version 10.4 you can add 360° effects including blurs, glows, 360° patch to instantly remove cameras and rigs from the scene, change the orientation and more. Only on MAC. 360 Video Stitcher for Mac. It states for the Samsung Gear 360 Cameras, but it may work for other cameras. I don’t have a mac to try it out, it does have a 15 day free trial period then its $ 49.99. Check it out and let me know if it’s any good. Make great 360 projects with Molanis 360 VR Video Editor, the most flexible 360 video editing software. Trim, cut, fade; add text, images, effects; manage color, correct the horizon, change the start point, cover your tripod, use 360 video stabilization, add sounds and music, animate most objects using keyframes, use proxy editing for 4K videos, edit 3D 360 videos. A lifetime license costs $199, but I’ve seen it on sale for $69. Only compatible with windows 64 bit. A free, open source, cross-platform video editor that has almost the same capabilities as paid software. You may have to re-inject the 360 metadata after editing. Easily edit your 360º photos, change the central focal point, orientation with yaw and pitch adjustments. The in painting tool is the same as photoshops healing if not better. Plus you can purchase with a one off fee and not have to pay out every month. See my tutorial here. Kandao Raw+ uses computational photography techniques, similar to what we are seeing in many high-end smartphones, to create images with increased detail and dynamic range, as well as lower noise levels. To achieve that it combines a burst of Raw images into one single DNG file that can then be further edited with a Raw converter of your choice. This does only work with Raw files though, so you will need to have one of the newer 360 cameras like Xiaomi Mi Sphere, Insta360 One or Gopro Fusion. It doesn’t have 360 editing, but GIMP is a great free open source cross-platform image editor that has almost the same capabilities as paid software. You may have to re-inject the 360 metadata after editing. Decent 360º degree cameras have a built-in gyroscope to automatically correct vertical orientation, but sometimes the gyro doesn’t work as intended. With this program you can level your shot and even stitch. With Hugin you can assemble a mosaic of photographs into a complete immersive panorama, stitch any series of overlapping pictures. Its Open Source software, free to use, modify and share. Stitching software for Windows and Mac. Originally started as a Graphical User Interface for Panorama Tools (hence the name), PTGui has evolved into a full featured, industry leading photo stitching application. This has recently added 360 camera fisheye templates to its library, so you can stitch with a click of a button. Once you’ve calibrated it that is. If you master, you can save time with batching processing. Pro features are locked and tied to the more expensive versions. an advanced panoramic image stitcher created by the Microsoft Research Computational Photography Group.ICE can also create panoramas from a panning video, including stop-motion action overlaid on the background. Finished panoramas can be saved in a wide variety of image formats, including JPEG, TIFF, and Photoshop’s PSD/PSB format, as well as the multiresolution tiled format. ICE can add missing pixels around the edges of panoramas, enabling smooth boundaries for partial or incomplete images. Real Time – Affordable – Optical Flow Stitching – Mistika Technology. Probably the best stitching software currently out there, but it comes at a price from 49,00€ / Month or 499,00€ / Year. This is solely for use with the Xiaomi Mi Sphere or Madventure 360 cameras. There is no official desktop software for the Mac yet, which has frustrated many. This tool created by Dong Qiu does just that stitching like the windows version and able to batch process and stitch the DNG files too! Find his installation instructions here. This one will re-inject 360 metadata into your equirectangular photos taken with any 360 camera. If you edit your shots in Photoshop or similar tools you may wipe out or mangle this metadata – and if you shoot and stitch your own 360 panoramas the files may not have the metadata in the first place. Exif Fixer helps fix this; it reads the full metadata from a selected JPEG or PNG image, and if the required elements are missing it can add them for you with a single click. Plus if you have a load of photos you need fixing, you can batch process them all at once. When you download it you get a zip file, just extract it to where you want on your computer and open the .exe. My Windows smart defender did warn me it was unrecognised, but just select run anyway. This is the one is browser based, so no need to download a program. I have been using this a while now and its very simple, just drag and drop your photo and simply change all the exif data you want from, EXIF General, EXIF Camera Settings, IPTC Tags, GEO Tags, XMP Tags and XMP GPano Tags and then just download your photo with the new exif data. It’s great you can even change the gps with a simple drag and drop of a pin on google maps and of course add 360 metadata so the photo is recognised as 360. Googles simple UI for easy 360 metadata injecting into your videos. Just download the zip file and double click to open it. Then just hit the open button, select your video with missing metadata, make sure you’ve checked the video is 360 and hit the inject button. Just sit back and wait, Its as simple as that. Find it on Github or download it below. Photomatix Pro and Essentials are standalone programs running on Windows and Mac. Create HDR photos and adjust them to get the look you want, from realistic to creative, using one-click presets and a large range of settings. This ones not free though a license costs $99 for Photomatix Pro and $39 for Photomatix Essentials. Find out more here. This has only recently come on the scene, but has had dramatic upgrades in a short space of time and is now rated as one of the best. It has a tone of tools and features to play with giving great natural or extreme looking results depending on your preference. It works on either Windows or Mac. You can try it for free for 14 days, then its £89. Find it here. For someone looking to play around with HDR, this program produces some nice looking natural images. Best of all it completely FREE. It can be a little slow, but the results are worth it for the price. Check out the website here. Picturenaut is a very easy program to use and install. It can be slow and it did crash once or twice, but it is Free so I can forgive it. Add the power of the Nik Collection by DxO to your workflow today and create stunning images faster. Including 7 plugins for colour, sharpening, B&W, HDR and noise reduction. I have been using this from when it became free in 2016, but unfortunately as of June 2018 the collection is no longer free 🙁 You can still try it on a 30 day free trial, but it’s $49.99 to buy and now it only seems to work with Photoshop. You can still find the old free version apk file here, this can be installed on Affinity, instructions here. Use these plugins for Adobe Premiere Pro and After Effects for professional reframing and editing of your 360° videos. Flaming Pear is useful creative plugins for photoshop, patching nadir or working directly on pano, find them here. Online tool for nadir patching, you can find it here. DronePan will take 20 photos at the necessary yaw and pitch to create photos that can be easily stitched together for a 360 spherical panorama. The process takes less than 2 minutes., you can find it here. For editing photos & videos on the move, Im using either Theta+ or VeeR Editor now they’ve got rid of the watermark. To remove unwanted objects in photos im using Touch Retouch. To create a traditional 16:9 video then there is a choice, Theta+, Collect or Insta360 One free capture. Personally I use Theta+ more often than not. For your adjusting photos, for now anyway, there is still only one app for fixing horizons and that’s Edit360. For grading your photos then Snapseed is by far the best choice. For animation effect a mix of Insta One or Theta+ for easy quick sharing and not forgetting Plotograph or if your on android Zoetropic. For editing the metadata then Photo Exif Editor is my number one go to app. IOS try Photos Exif Editor. For Bracketing I use Vibrance HDR. For videos I do like PowerDirector 16 Ultra for windows or if you can afford to then Premiere Pro & After Effects are also great. MAC users can also try Final Cut Pro X (Version 10.4). For free video editing I would use Garmin Virb Edit is great for adding floating text to your videos & Insta360 Studio for One X software for manipulating your 360 videos into a traditional 16:9 video using its keyframes from tiny planet down to standard view, you choose so the camera is always pointing at the action where you want it. Photo editing Affinity Photo with a one off fee is the easiest, cheapest option or if you can afford the £20 monthly fee there’s Photoshop CC 2018. For Stitching there’s Hugin or PTGui. Both can be fiddly to do. PTGui version 11 includes double fisheye templates for certain 360 cameras. For Bracketing If you can afford it then Aurora 2018. For Free then Luminance HDR. What do you use for editing your 360's? Do you have any tips? Hi Ash, I saw that you had problems using Exif Fixer. I’m the developer – can I help? If there’s a problem I would very much like to fix it! You can reach me through my Facebook account or from contact links on the Exif Fixer home page.